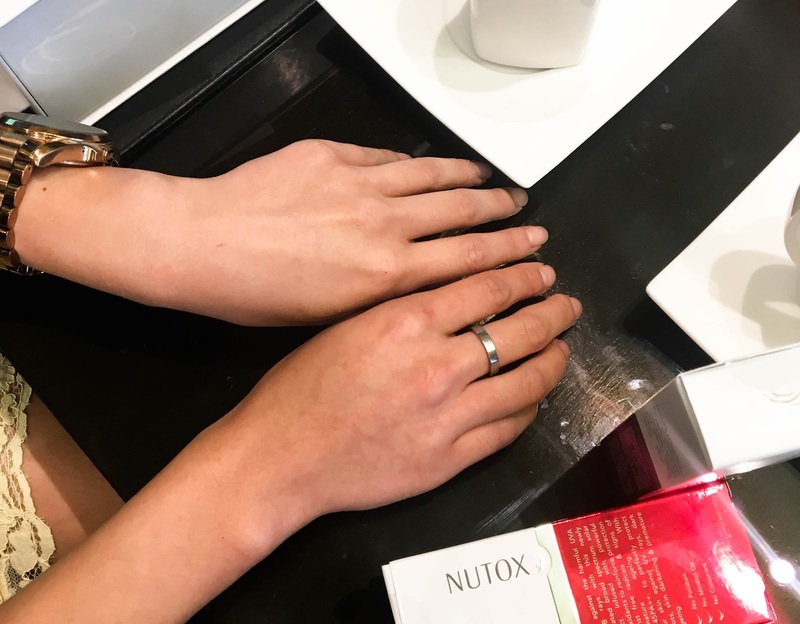 NUTOX in Singapore + Interviewing Nancy Wu! I'm very honored to have met her in person, and we even got the chance to have a closed-door interview session with her. For those of you that don't know, she is the ambassador for NUTOX, a skincare brand and has been their ambassador for the past 3 years! After chatting with her and of course, scrutinizing her skin... I knew I had to pay full attention to her skincare tips and product recommendations. Her skin was flawless! Not only did it not show her true age (she's 36 btw) , it was also super healthy, radiant, full and firm and fine lines were super minimal. 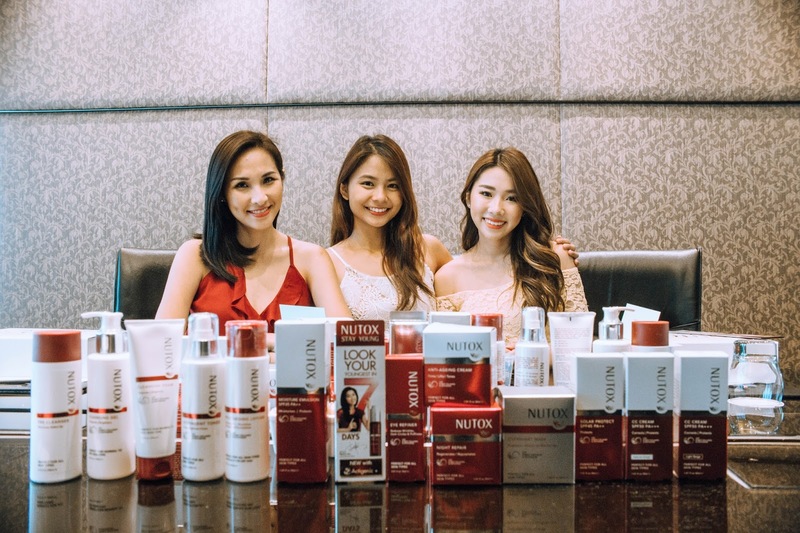 I gotta be honest with you guys, at the time of the interview, I haven't tried NUTOX products yet but after seeing Nancy Wu's skin and hearing from her, I was so eager to get my hands on the range, which had clinched the Top 3 title in categories of Anti-ageing moisturizer and serums in Malaysia. At the event with ma ladies! 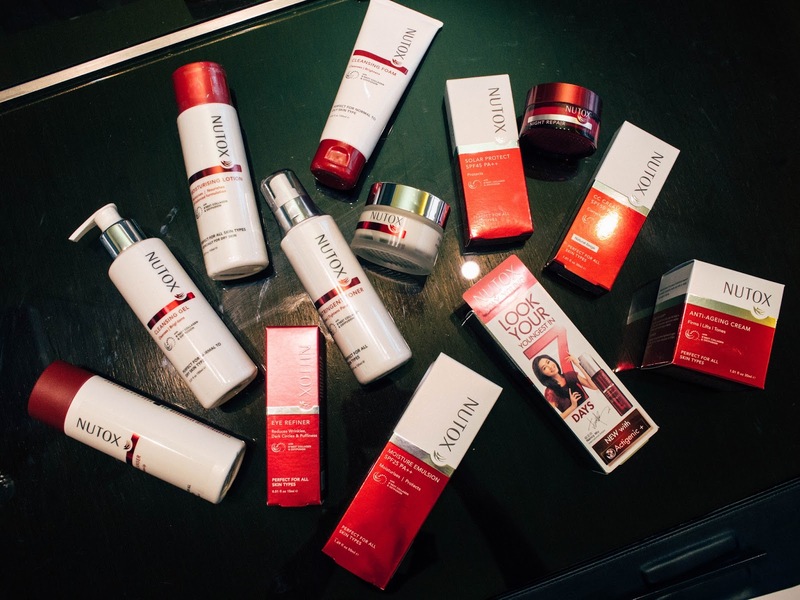 This is the full range of the NUTOX Stay Young range, where you can find a FULL RANGE in there. I love it when skincare brands make a series in a FULL RANGE because you'd know that the products formulated are all going to be complimentary with one another. We had so much fun at the conference room the moment we got our goodie bags full of NUTOX products. Girls being girls, we didn't hesitate and got our hands dirty. I followed the steps on the screen and started on my "NUTOX skincare routine" on the back of my left hand. After Pre-Cleanser, Moisturizing lotion and the NUTOX Advanced Serum Concentrate... (note this is not even all the steps yet) , I was presented with this shocking find. My left hand was SIGNIFICANTLY Firmer, smoother, brighter and my fine lines were so much less visible compared to the right! Everyone in the room were equally as wow-ed. My jaw dropped at how effective it was, all it took was just 5 mins and I saw results. 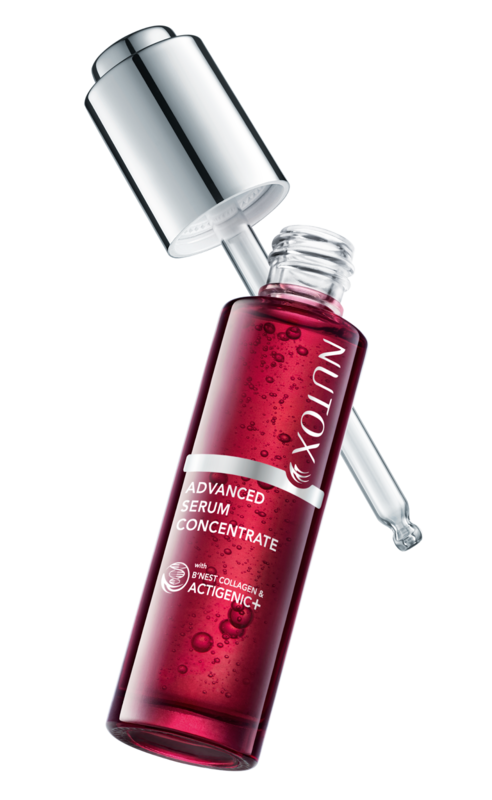 The NUTOX Advanced Serum Concentrate is famous for their tagline "Look Your Youngest in 7 Days" and while I was quite skeptical at first, it started to unfold before my very eyes I HAD to believe it. No choice, let me take more photos for a bit! So after using the full range for about 2 weeks now, I have definitely felt and seen results! This is the star of the entire range, and it's also a product that was highly raved by Nancy Wu herself. She said that this serum delivered lots of anti-ageing benefits to her skin and also helped to firm and reduce fine lines. While I don't have much issues with fine lines nor dullness myself, I certainly felt my skin feel firmer, and have seen some radiance effects too. It is also loaded with Actigenic+, a self-regenerative system that combines micro algae and Indian Gentian Extract obtained using advanced technology to promote collagen and cell regeneration. I personally dislike it when serums are thick and sticky, as usually makeup wouldn't stay for as long as I would it to when that happens. But thankfully, the NUTOX Advanced Serum Concentrate works amazing under makeup! Make up glides on so much smoother after and my complexion appears more glowy, plump instantly. Being always around and about, my skin has suffered from the changes in climate and lack of sleep. It is often thirsty, and dull. 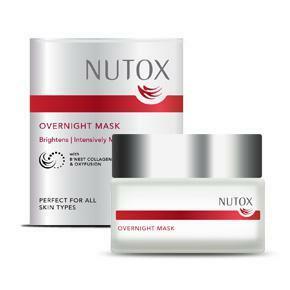 This mask provides intense hydration and long-lasting moisturising effects for up to 72hours. I love this mask because it is unlike the usual, it's super thin and light and almost gets absorbed into your skin immediately. And, it works while you're asleep! The last thing I want is for my pillowcases to be stained with products the next morning and this doesn't do that for me. So for all you get-goers like me, this product could just be your lifesaver, especially if you need that extra boost of hydration while travelling. PLUS, i wake up to brighter, more hydrated skin. What's there not to love? This pre-cleanser acts as a 2-in-1 product to help remove makeup on the skin, and also unwanted impurities. I love how gentle it is, with a milk-like texture that helps me gently remove makeup. Due to shoots and events (and of course, my love for makeup HAHA) I wear pretty heavy makeup on my skin daily. Therefore, removal of makeup is crucial as leaving traces of makeup products on the skin can lead to clogged pores and oftertime, the formation of fine lines. 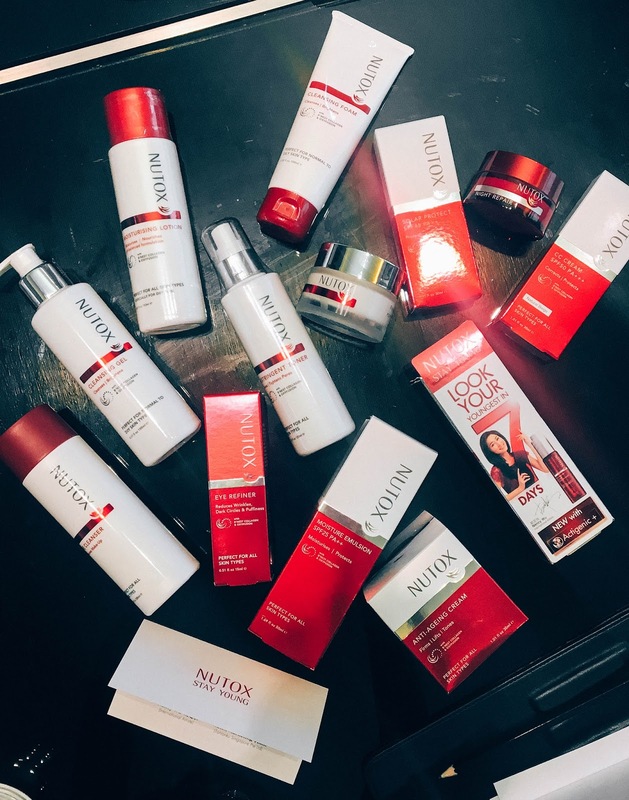 To ensure that all traces of makeup have been removed, I'll usually do a "double-cleanse", and I found that the NUTOX Pre-Cleanser is super suitable for that because it's so gentle, and doesn't strip my skin off of its moisture! Double-cleansing isn't as drying or harsh as it would be now! They are available at Watsons from 14th September onwards, go get your hands on them now!